My fourth visit to The Dairy and as great as ever. The combination of utterly delicious, zingy fresh flavours, much from their roof top, and such laid-back service makes for really relaxed dining that is always more than the sum of its parts. I can’t get enough of the bone marrow butter and am cool about it being perched on a pebble, unlike some critics. The sourdough is fabulous too. And a little pot of ultra rich chicken liver and apple mousse goes down a treat. After snacks of deep fried anchovy and lettuce cups with sorrel granita, barely cooked cuttlefish with black garlic butter is sensational and tangy. 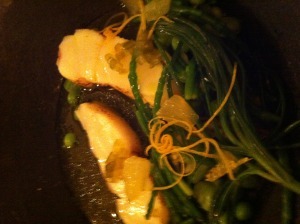 Most enjoyable among “sea” dishes is monkfish with miso, samphire, peas and broad beans (pictured). Utterly moreish is aged, smoked beef served rare with ember cooked artichokes. Besides the favourite caramel chocolate dessert, I adore rhubarb mini doughnuts.